• High quality cork handle. • Ideal for feeder work or straight lead. • Supplied with two quivertips: 1oz & 2oz. 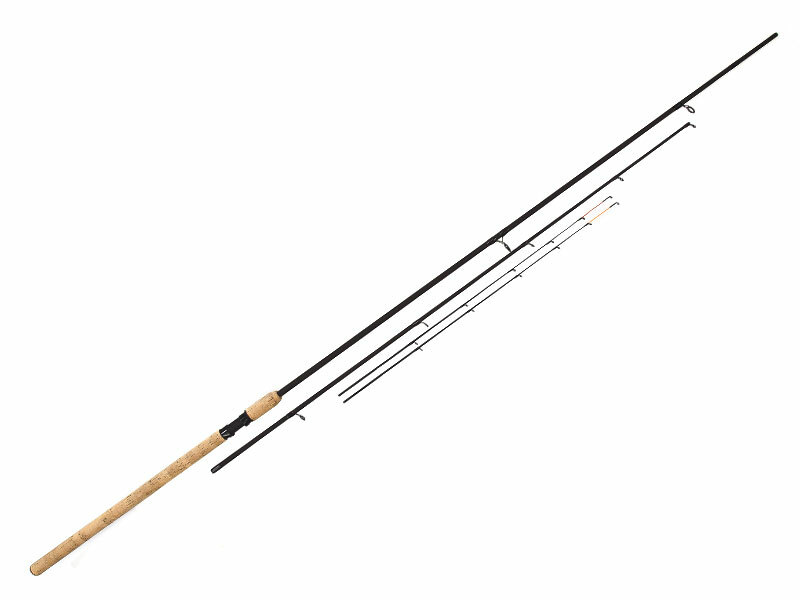 The rod has a full cork handle and two equal-length sections with a line rating of 4-10lb. There's plenty of power to comfortably launch 2oz feeders when you're targeting fish over the pound mark. The 1oz and 2oz carbon quivertips are well-matched to the rod with the stiff 2oz tip first choice for using with a Method. The lighter tip would be great on rivers. If you're the sort of angler who likes to divide his bankside time between rivers, natural lakes, large canals and commercial pools, wouldn’t it be great to have one rod to suit them all? This super-versatile tool has two equal-length sections and comes with two spare 1oz and 2oz push-in carbon quivers. It really does have a multitude of uses and will turn its full cork handle to anything, from maggot feeder and straight lead fishing on rivers for chub and barbel through to open-ender tench and bream tactics. It’ll also chuck a Method feeder for commercial carp. Having spent a few hours using the test sample from Korum, I can report that it won’t necessarily lend itself particularly well to finesse feeder tactics using tiny hooks and gossamer hooklengths. So if you’re after a net of roach and skimmers, it sadly won’t fit the bill. However, it is very impressive with fish from 1lb upwards, which is probably why it carries a manufacturer’s line rating of 4lb-10lb, which seems about right to me. Although this is a rod with multi-venue possibilities, time was somewhat against me for my live-test day so I chose a water containing all sorts of fish, in all sorts of sizes. The picture-postcard day-ticket Stretton Lakes near the A1 in Rutland fitted the bill. I started the session using a 28g pellet feeder with a banded pellet hookbait, cast tight to an island. This soon caught me a string of stockie carp of 2lb-3lb, which all put a healthy and progressive fish-playing bend in the rod. Its action is geared towards hard and fast playing power, as opposed to a fancy and forgiving one. But whatever it loses in guile is certainly more than made up for in its casting performance. For an 11ft model it has plenty of poke, can withstand a proper whack, and will easily launch at least 2oz of lead. The carbon quivertips both work perfectly with the rod, with no sign of flat-spotting or making the blank feel top heavy. I have long been an advocate of using stiff carbon tips for all my Method feeder work and the 2oz tip worked a treat when I switched to a 30g flatbed Method cast towards the far-bank reeds. It also struck me that the Korum rod would be very much at home on snag- strewn small rivers, where the stocks of chub and barbel succumb to straight lead, bread/cheese and meat tactics. What a great little all-rounder of a rod this is, and it comes with a very reasonable price tag! Ideal for a multitude of legering tactics, it really is every angler’s flexible friend.